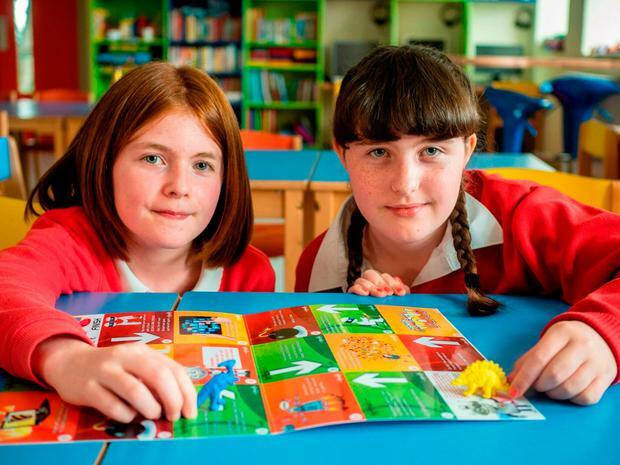 IN AN age where children are literally growing up online, a class of bright pupils has created a game to encourage internet safety among their peers. Pupils from fifth class at Lehinch National School, Hollymount, Co Mayo, created the Internet Safety Game to make children aware of cyberbullying and other online dangers. 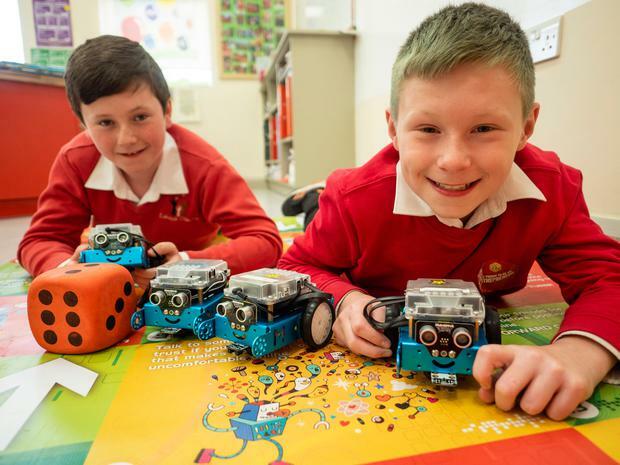 They believe the floorboard game, which uses robotic technology to take players through safe internet practice, could make a real difference in children's lives. Competitors roll a dice to choose the safest options for online survival and then, using an iPad as a remote control, they move a mini robot across the game. A player moves ahead in the game if they opt to post positive messages online, but they miss a turn if they give out their address online to a stranger. Some squares offer advice on how to stay safe online. Pupil Caoilinn Walsh said the reason they came up with it "was to make children aware of the dangers, so we can be a bit more safe online". She added: "The most fun moment was probably when we saw the final layout of the game. It looked really cool." The pupils designed the game as part of the Junior Entrepreneur Programme (JEP), which helps young minds to realise their potential as young business leaders. "I learned how to code using iPads, to program the robots to move. I also learned that being an entrepreneur takes hard work and teamwork," Caoilinn said. "I think entrepreneurs play a very important role in the local community because they create products and games like we did. They make big companies and invent new things. "When I'm older, I would definitely consider becoming an entrepreneur." She said she was delighted in showing off the product at the JEP showcase at the RDS in Dublin in June. "People really liked our game. Some people bought it and they said it was very techie." The children learned to doublecheck their finished work, as they realised they'd made a mistake after the first prototype came back from the printers. This led to having to touch up the design, but the printers were able to fix the issue quickly and this added to the learning process. The pupils were recognised as `Change Agents' at the RDS, as the game was believed to have the potential to bring about real and positive change within communities and families. Figures released this week by CyberSafeIreland, the children's internet safety charity, revealed that 32pc of children are talking to strangers online every week and 30pc rarely or never talk to their parents about online safety. The Government has set the digital age of consent at 13, so this means that young children are policing themselves online and many aren't given the web education to do this. The young entrepreneurs created the game to empower those children. While only a small number of children involved in JEP will grow up to become entrepreneurs, the others are being taught critical life lessons for their futures, including independent thinking and how to create something from scratch. Schools participating in the initiative will have the opportunity to showcase their businesses at the JEP All Ireland Showcase Day at the RDS, Dublin, in May next year.